One of the most significant symbols for Christmas aside from the Nativity scene and Christmas tree is Santa Claus, the big bearded man loved by kids and a popular character for giving gifts a night before Christmas day. Santa Claus also known as Saint Nicholas, Father Christmas or simply, “Santa” is a character/figure with legendary, mythical, historical or folklore origins. In western cultures, his character is mostly associated as someone who brings gifts to the homes of “good” children during the late hours of Christmas Eve. Santa Claus is generally described as a jolly or joyous, white-bearded man – sometimes with spectacles and wears a red coat with white collar and cuffs, white-cuffed red trousers, and black leather belt and boots. This depiction became popular in the United States and Canada during the 19th century as influenced by the 1823 poem of Clement Clarke Moore called “A Visit From St. Nicholas” and Tomas Nast‘s interpretation of Santa in a caricature called “Merry Old Santa Claus” from the January 1, 1881 edition of Harper’s Weekly. The image has been maintained and immortalized through time in various children’s books, songs, television and movies. 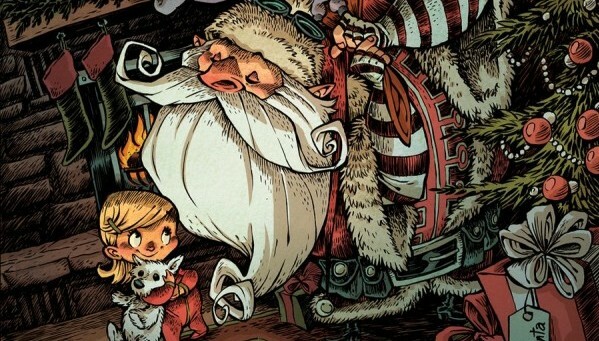 To show how much Santa has influenced many lives of people and to celebrate the Christmas spirit of the season, we here at You The Designer have collected some of the coolest, amazing, funny and unique fan art illustrations of Santa Claus by various artists over the Internet. Lets see how the original image of Santa illustrated by Thomas Nast has evolved. Check them out below and enjoy! Which artwork is your most favorite? Tell us your thoughts as well as your suggestions by commenting below.